Yes, Timber Lodge is a steakhouse — and a really good one, too. Come in on a Sunday, though, and be treated to a hearty brunch menu. Eggs Benedict, omelettes and waffles are all cooked to order. For diehard bacon lovers, there’s even a waffle made with bacon-loaded batter. Another reason to visit Timber Lodge on Sunday? It’s the only day of the week you can get one of their Bloody Marys for just 99 cents. Everyone in Brunswick (and beyond) knows to go to Kelly’s for crepes. From plain cheese to bacon, brie and strawberry, Kelly’s has a crepe to please every palate. With a down-home atmosphere and friendly staff, you’ll feel like a local even if you’ve just rolled into town. Blink and you might miss Flo’s Bistro, so keep your eyes open. This cozy cottage-style restaurant cooks everything from scratch, and it shows. Crispy potatoes, fluffy omelettes and bagel sandwiches are favorites among regulars. Flo’s is only open until 1:00 p.m. for brunch on Sunday, so arrive early enough to get your fill. For a unique dining experience, spend part of your day at Architectural Justice. Nosh on delectable European-inspired cuisine like artisan French tartines topped with tantalizing ingredients such as short rib, goat cheese and the cafe’s house-made fig jam. When you’re done, shop the gallery for unique home decor pieces and artisan furniture. If you find yourself inspired by the delectable menu, sign up for a chef-taught cooking class to learn how to create a little culinary magic of your own. If you’re looking for a good old-fashioned greasy spoon diner, head to Luna’s. Low prices and huge serving sizes add to the appeal of this hometown favorite. The fare is nothing fancy, and that’s just how Luna’s customers like it. 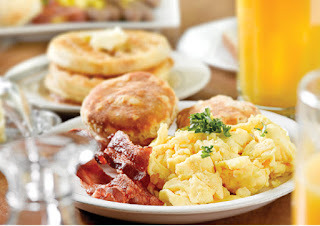 Come in any day of the week for eggs and bacon, hash browns and other classic breakfast dishes. Don’t let the no-frills looks of the place fool you. There is some seriously good food to be had at this plain-Jane eatery. All the usual fare is here, plus some tasty European options to broaden your breakfast horizons. Try potato pancakes or smoked Slovenian sausage. And then there’s the bakery. Strudels, cakes, croissants and more — all made fresh daily.